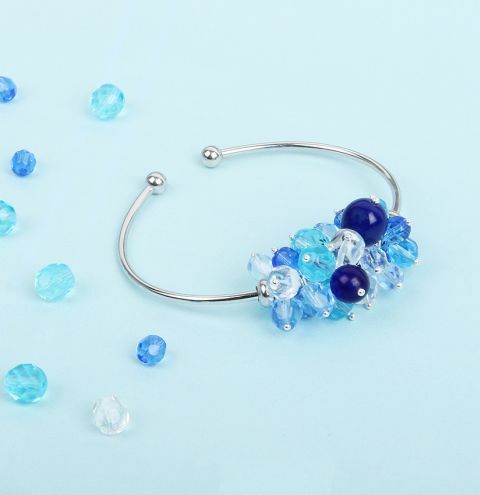 Create a sparkling sterling silver bangle with a beautiful mix of Preciosa beads! Thread 1 bead on to a headpin. Cut the headpin to the desired length and bend the headpin into a loop. Repeat with all the beads. Unscrew the ball end of the bangle and remove the doughnut stopper bead. Start attaching the beads to your bangle. Keep attaching headpins and beads to your bracelet until you are happy with your cluster effect. Slide the doughnut stopper bead to secure the cluster into place and replace the screw ball end.